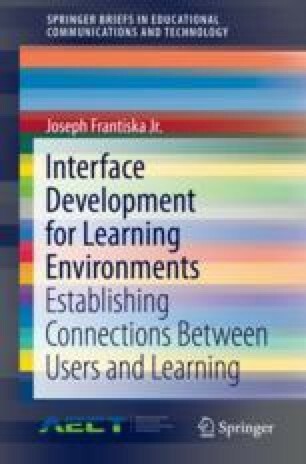 The usage of text within a learning environment provides the designer with some unique challenges and possibilities. For all the discussion about using and developing multimedia for the Internet, the primary means of communicating ideas is text. Text can be the most useful yet the most restricted. Its utility derives from its direct communication of ideas. That is, while one picture can be worth a 1000 words, that picture can be interpreted differently by different users. A text message allows specific ideas to be sent concisely. It is restricted since unlike images, animations, or sounds, there are only a few means to manipulate it and in turn the meaning that it is trying to convey. The attributes of text that can be manipulated are boldness, italicizing, size, color, font size, font type, line spacing, underlining, and contrast. Special code within a website can allow additional text features such as blinking. Text can create numerous challenges. If a window is minimized, the scrolling ability can be compromised. Blocks of text can have long unbroken passages and the font used may not be of the proper size or format. Also, is text contained within tables readable? Is the usage of text color appropriate? While blinking text is useful in providing warnings, the overusage of them can be irritating and distracting (Davidson-Shivers and Rasmussen, Web-based learning: design, implementation, and evaluation, 2nd ed., Springer, Upper Saddle River, NJ, 2018).